In Monday’s live finale, award-winning journalist, author, and talk show host Geraldo Rivera faced off against best-selling author and television icon Leeza Gibbons in the exciting boardroom conclusion held in New York City. The event was followed by a star-studded party at Trump Tower, hosted by finale task sponsor Universal Orlando Resorts. As “The Celebrity Apprentice” winner, Gibbons’ designated charity will receive the $250,000 prize, which will be added to the show’s $2 million total charity earnings for the season. “The Celebrity Apprentice” has raised approximately 15 million total dollars for charity over the years. Gibbons raised a total of $714,000 for Leeza’s Care Connection, while Rivera raised a total of $725,184 for Life’s WORC." “We had an incredible season and an incredible set of players this year. However out of the 16 contestants Leeza clearly demonstrated that she had the ultimate skills necessary to be called the next Celebrity Apprentice,” said Mr. Trump. "The Celebrity Apprentice has proven time and time again to be the toughest reality show on television today. Leeza was able to win $714,000 for her charity, Leeza’s Care Connection. I congratulate Leeza on her win and welcome her as the second woman to the elite group of winners including Piers Morgan, Joan Rivers, Bret Michaels, John Rich, Arsenio Hall and Trace Adkins. I’d also like to congratulate Geraldo on his tremendous effort and impressive game play." Trump’s last and most challenging task for the final two contestants was to create a commercial for vacation packages to Universal Orlando Resort. The commercials were then judged at a New York red carpet event based on creativity, brand message, money raised selling vacation packages and overall presentation. Six celebrity contestants returned to help the two finalists who had to work together to bring star power and sale skills to an overall presentation. In addition to Universal Orlando Resorts, this season’s sponsors included Anheuser-Busch, Cosmo Body, King’s Hawaiian, the Neat Company, Luvo, Chock Full O’Nuts, Trump National Doral and the Ivanka Trump Collection. When the season began Jan. 4, the women included Gold Medal Olympic snowboarder Jamie Anderson; movie star Vivica A. Fox; best-selling author and television icon Leeza Gibbons; reality star and best-selling author Brandi Glanville; TV personality, author, and mother of eight, Kate Gosselin; world-class gymnast and gold medal Olympian Shawn Johnson; Kenya Moore, former Miss USA and star of “The Real Housewives of Atlanta”; and television icon Keshia Knight Pulliam. The men included two-time World Series champion Johnny Damon; actor and legendary comedian Gilbert Gottfried; Sig Hansen, the star of “Deadliest Catch” and Captain of the Northwestern; Grammy Award-nominated and multi-platinum musician Kevin Jonas; Golden Globe-nominated actor Lorenzo Lamas; NFL great Terrell Owens; award-winning journalist, author, and talk show host Geraldo Rivera; and television and movie actor Ian Ziering. This season, Mr. Trump’s advisors included Ivanka Trump, Donald Trump Jr., Eric Trump and George Ross as well as former “Celebrity Apprentice” winners Piers Morgan and the late Joan Rivers. 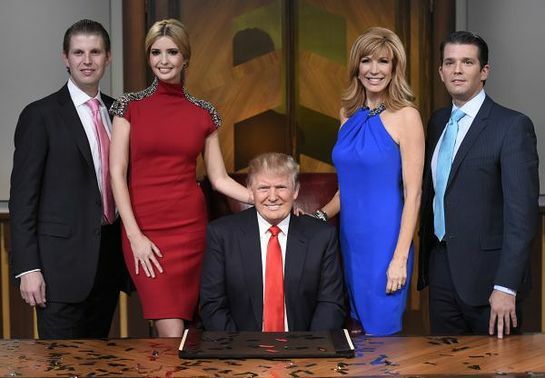 “The Celebrity Apprentice” is produced by United Artists Media Group (a joint venture among MGM, Mark Burnett, Roma Downey and Hearst Entertainment), in association with Trump Productions. Mark Burnett, Donald Trump, Page Feldman and Eric Van Wagenen are executive producers. Please visit NBC.com’s official show site.